DonQui is relieved to arrive back in England to crisp, sunny, autumn weather. Although it certainly feels cold after Tanzania’s mid 30° temperatures, at least it is not grey and rainy. 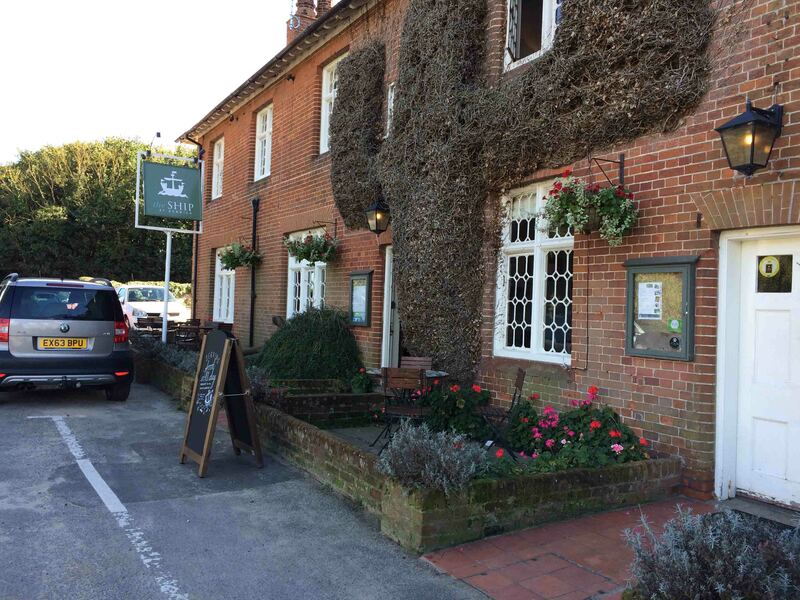 It being that day of the week, DonQui decides to partake in the English ritual of a walk in the country followed by a Sunday roast at a suitable pub. One of his favourite places to do this is Dunwich. Now not many people have heard of Dunwich and with good reason… Like Atlantis, most of it lies under the sea. Yet back in medieval times Dunwich was one of England’s most important towns. It was in the top ten listed in the Doomsday Book of 1086, growing in size and prosperity over the next 300 years. Trade with Flanders and the royal shipyards made Dunwich the most important port on the East coast, second only to London. 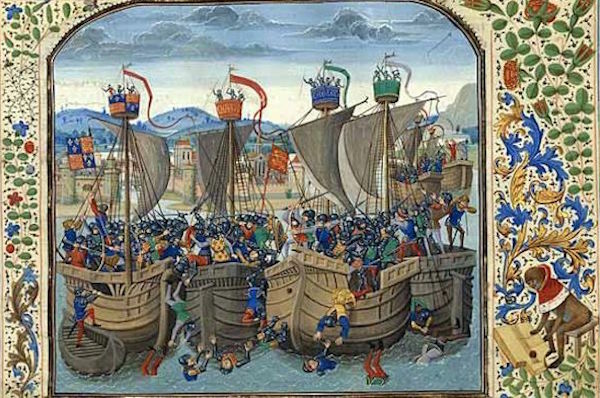 It was here that King Edward III’s fleet was built for the invasion of France in the Hundred Years War. However, the sand cliffs on which Dunwich is built are highly vulnerable to erosion. A great storm in 1347 swept away 400 houses as the cliffs crumbled and fell into the sea. In the years that followed the once great port silted up and the Blyth River changed its course. By the beginning of the 17th century Dunwich had lost 3/4 of its original size and the erosion continues still. 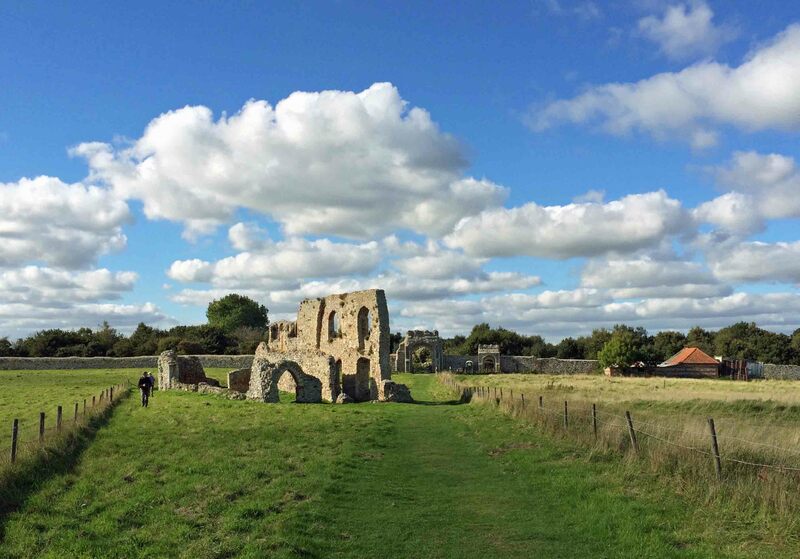 Today all that remains of the once great medieval city are the ruins of the Greyfriars monastery and St James’ chapel which once administered to a leper colony. Both of these buildings were inland from the original city walls. All that was once inside the walls is now under the sea. 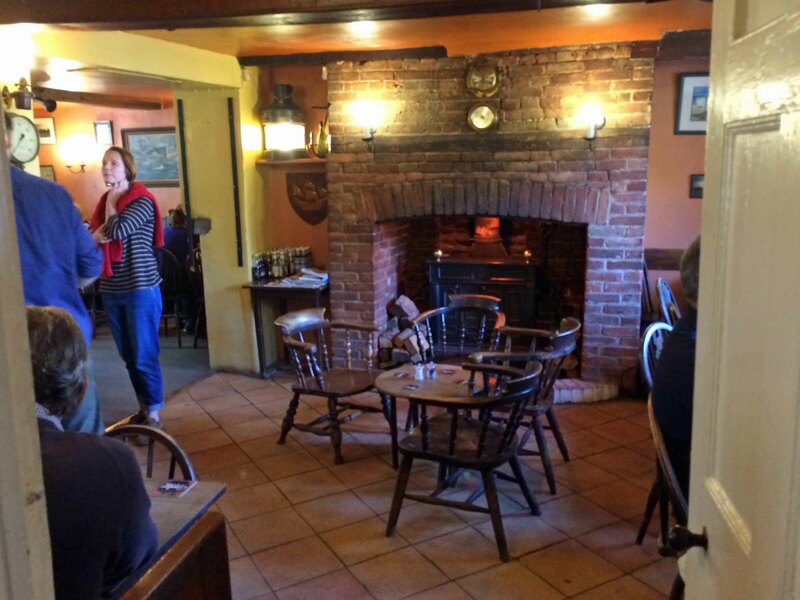 Tucked in amongst the cottages of modern Dunwich is the Ship Inn — one of DonQui’s favourite pubs in the area. After a circular walk over the cliffs, through Greyfriars’ Wood and around the monastery DonQui is ready for a pint and some roast beast with all the trimmings. 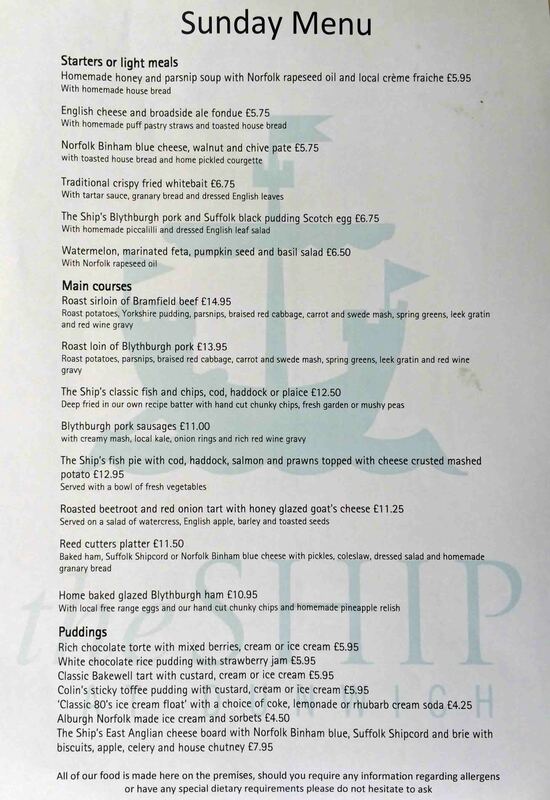 The Ship is a free house serving an ever changing selection of local beers and ciders. This is a rarity in these parts where most pubs are tied to Southwold’s Adnams’ brewery. 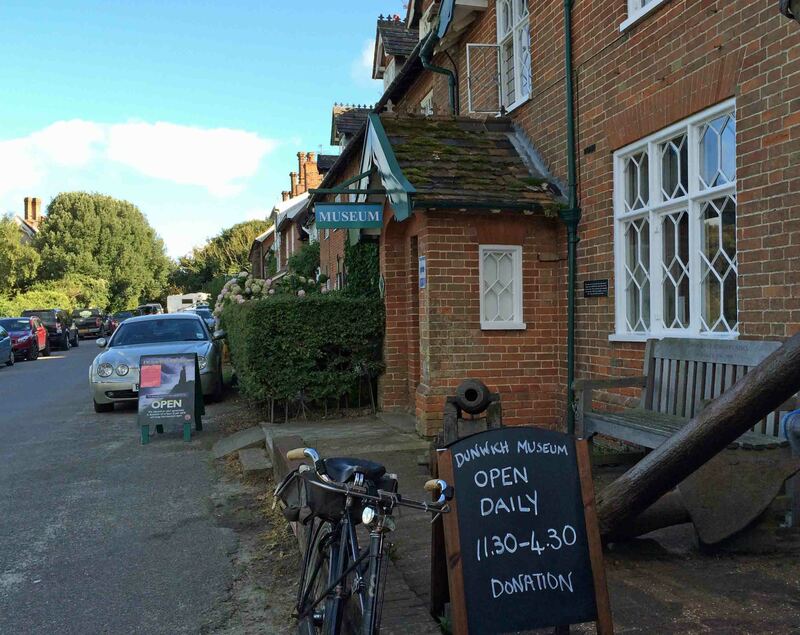 Now in the past there was no love lost between Dunwich and Southwold so it is perhaps not surprising to find the Ship maintaining its independence. Although DonQui is a great fan of Adnams’ beers he finds it refreshing to have a wider choice every once in a while. He samples the Jenny Morgan, and finds it quite refreshing with a light hoppy taste. Brewed by Green Jack of Lowestoft it is apparently named after a girl in an old mariners’ song who waits at home for her sweetheart who is out at sea. 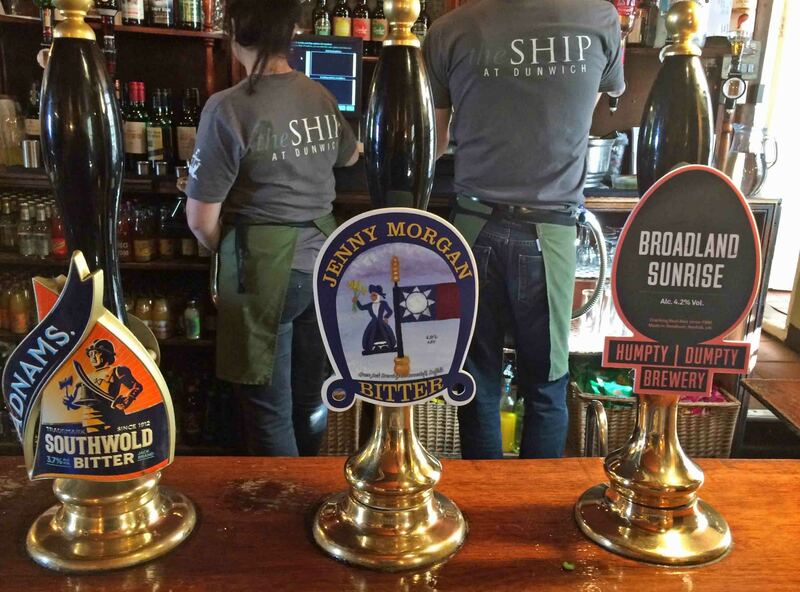 Unlike many pubs on Sunday, The Ship offers other options in addition to the traditional Sunday Roast. However it is roast than DonQui wants, choosing the beef while Duchess goes for the pork. They also decide to share the watermelon, feta, pumpkin seed and basil salad as a starter. It simply sounded too interesting to pass up and DonQui was glad he didn’t — it was utterly delicious. The Ship always does an excellent roast and this time was no exception. Both were very good but DonQui thought that the pork possible had the edge on the beef. Unfortunately he tucked into the food right away rather than taking photographs. 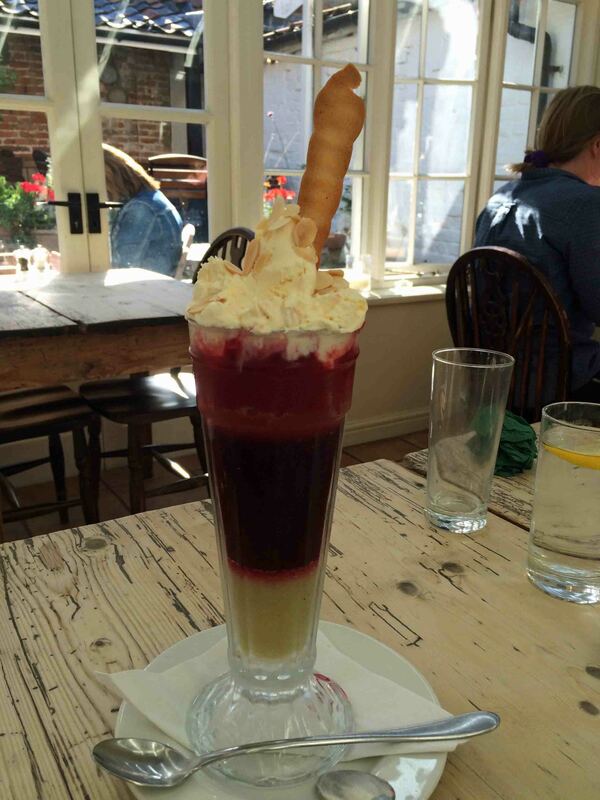 However he did remember to capture the image of the rather spectacular knickerbocker glory which served as an excellent shared desert.